The National FFA emblem, consisting of five symbols, is representative of the history, goals, and future of the organization. 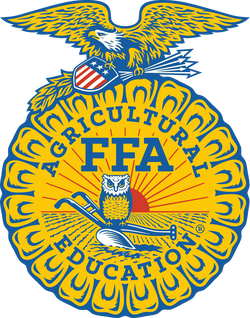 As a whole, the emblem covers the board spectrum of the FFA and agriculture. Each element within the emblem has a unique significance. The cross-section of the ear of corn provides the foundation of the emblem, just as corn has historically serverd as the foundation crop of American Agriculture. The rising sun signifies progress and holds the promise that tomorrow will bring a new day glowing with opportunity. The owl symbolizes the knowledge required to be successful in the industry of agriculture. The plow is the symbol of labor and tillage of the soil- the backbone of agriculture and the historic foundation of our country’s strength. The eagle is a national symbol, which serves as a reminder for the future of our freedom and ability to explore new horizons for the future of agriculture.